I've been using FreeCAD for about 2 years, but mainly for laser cut projects and I wanted to test it with more complex designs. I'm really satisfied with the results. I'm using FreeCAD 0.17 compiled from GitHub, so I've used all the new features of the Part Design workbench to create them. They could work as a reference for someone trying to learn medium-advanced skills on FreeCAD. Hi gsegura96, I see this is your first post (and quite a nice one), so welcome here! In looking at your images the models look nicely done! 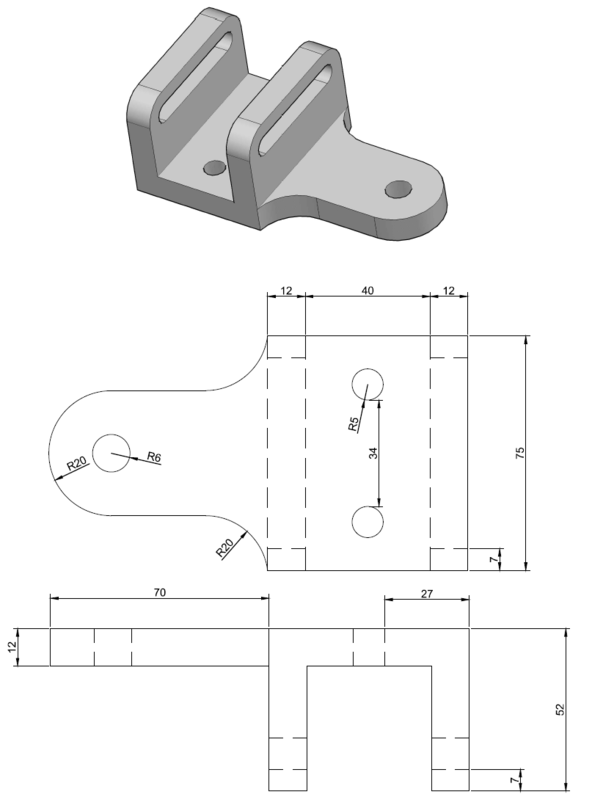 CAD Challenge 11 is here; it's from ten days ago and the images are below. gsegura96 wrote: I'm using FreeCAD 0.17 compiled from GitHub, so I've used all the new features of the Part Design workbench to create them. They could work as a reference for someone trying to learn medium-advanced skills on FreeCAD. The would serve nicely as tutorials (I think 0.16 would do too); I'm a little tempted to make a video of the modelling process. Creating a 2d drawing from the 3D model using Tech Draw would be nice to include. gsegura96 wrote: I wanted to test it with more complex designs. I'm really satisfied with the results. Thanks for your testimonial. It should help to encourage new users that it is definitely worth investing the time to become this proficient. Interesting Links, thanks for sharing. I am thinking of adding some sort of isometric-FreeCAD-Parts-Gallery to the Wiki-Tutorials (?) with images, and sample parts. Last edited by r-frank on Mon Jan 16, 2017 9:23 pm, edited 1 time in total. 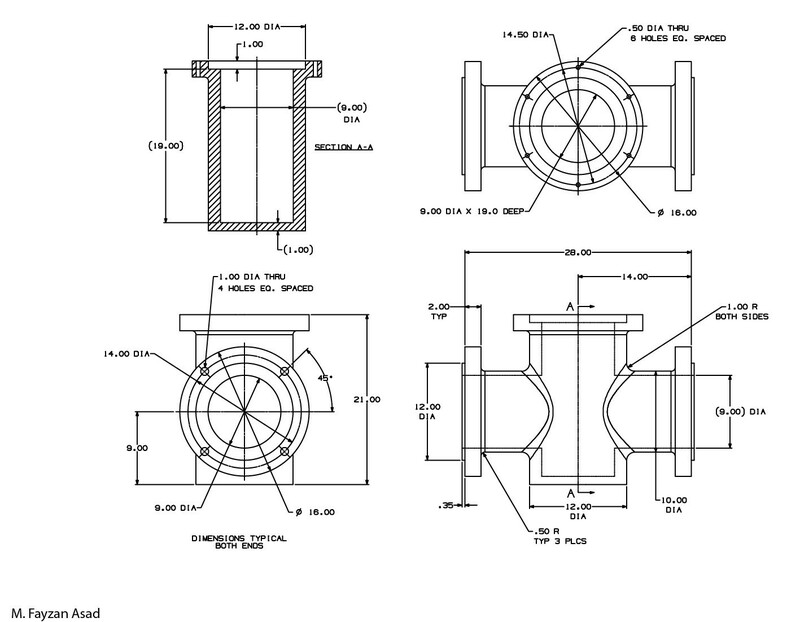 This is something I'm working in my free time, a document (fcd2p.pdf) with technical drawings-examples for practice. I hope that this will help begginers to get familiar with FreeCAD. Notice: This is not the final version.Probably there are some errors that I will remove the future( there is one missing E ), or I'll add more complex drawings. Until then enjoy in practice with current version. A_3 wrote: This is something I'm working in my free time, a document (fcd2p.pdf) with technical drawings-examples for practice. I hope that this will help begginers to get familiar with FreeCAD. This is a seriously awesome resource! It's basically an open source workbook for FreeCAD! It reminds me of something I saw in the Open Source Ecology wiki, instructions on how to take a "FreeCAD test" which involve recording one's desktop as some object is created, and then using Kdenlive to speed up the video into something that quickly shows how you create the object. It looks like Kdenlive is cross-platform, although RecordMyDesktop appears to be Linux only. Still, there's an opportunity here: instructions could be included for basically self-submitting proof of work for this workbook onto Youtube, helping create even more educational content and raising the profile of FreeCAD. What do you think? Do you plan on putting up a Github repo for the workbook? This is VERY nice A_3! A_3 wrote: This is something I'm working in my free time, a document (fcd2p.pdf) with technical drawings-examples for practice. Thanks. The next version will be probably set in a repo or some "drive". Thanks, new version will be up to date with 2017on cover page. r-frank wrote: Interesting Links, thanks for sharing. For me this is a good way of learning, follow along with detailed instructions, then do the problems at the end of the chapter (back when there were text books). If there were example files we can host them on the FreeCAD/Examples and link to them from the wiki.